The market is already flooded with Android tablets. And now, Lenovo has joined the bandwagon. 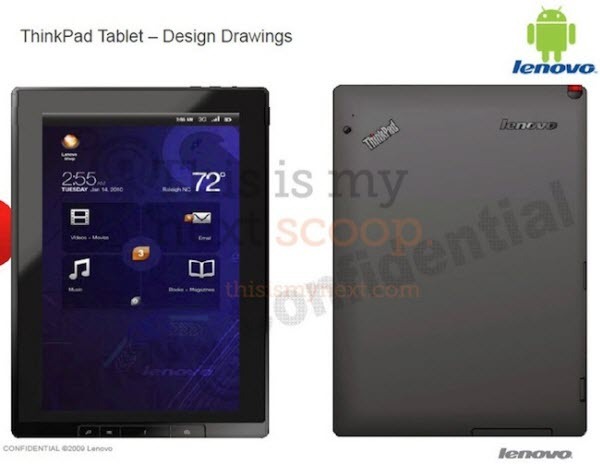 The company will soon launch its first tablet device. Recently, the leaked pics and specs of this device has been emerged. Lenovo’s first tablet device will be called “Lenovo ThinkPad” and it will be powered by the Android 3.0 (Honeycomb) Operating System. Lenovo ThinkPad will have a stylus for hand-drawn notes. Check out the leaked specs below. One of the unique feature of this tablet is the keyboard booklet, which allows you to switch over to the laptop mode. Lenovo ThinkPad is expected to be announced in June and it will be available for purchase from July. Lenovo ThinkPad will be available from $499 for the 16 GB version.